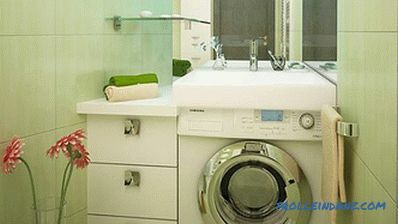 A washing machine has not been a luxury for a long time, but it’s difficult to find a place for it, especially in a small apartment. 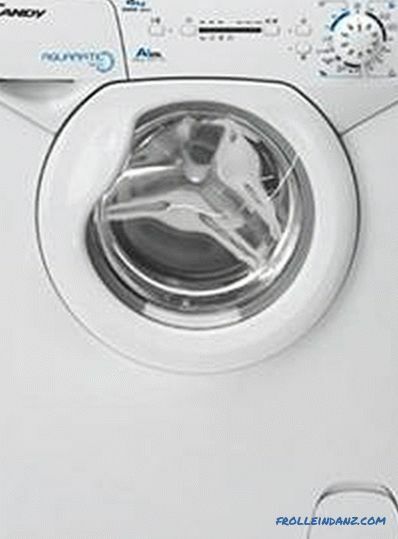 However, even if there is enough living space, a stand-alone washer does not always fit well into the interior. 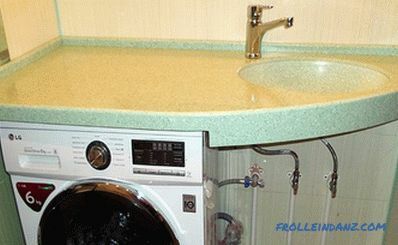 You can solve the problem if a specially designed sink is installed in the bathroom above the washing machine. 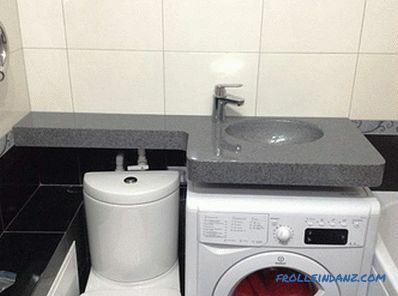 The use of such a specific sink has as advantages and disadvantages. 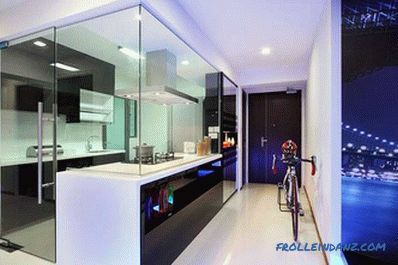 One of the most important advantages is the ability to save some of the free space in the room, in addition, the design of the room remains very attractive. The benefits end there. 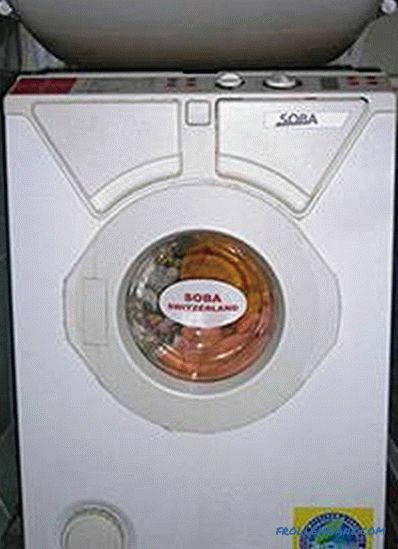 Now they even began to produce machines specially designed for installation under the sink, but their capacity is within 3.5 kg. 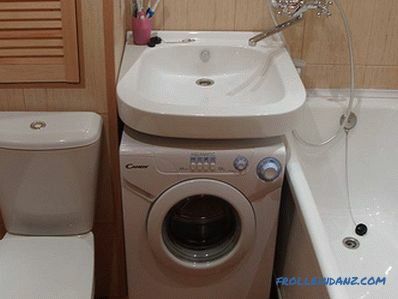 Capacious washing machine has large dimensions. Fastened to the wall, and if this surface is not designed to withstand such a load, you will have to work hard to strengthen it. Such shells are equipped with a specific flat siphon - this is a significant minus. If it fails, then purchase it separately is almost impossible. If furniture is installed around, then if there is a need to clean the siphon, the washing machine will have to be moved aside. The lily sink with side drain is often done without a slope, which prevents the water from completely draining. In this case, it will have to drain a rag. The machine prevents you from getting close to the sink. Some deficiencies may be significant for one person, and they do not interfere with another. At the very least, you need to weigh the pros and cons to make a final decision. 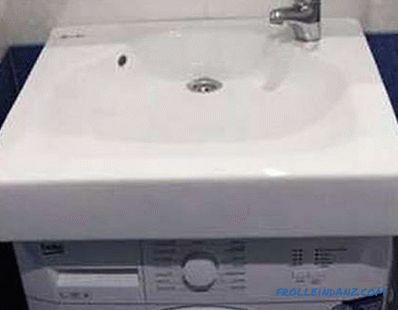 Due to the fact that over the washing machine a bit, the design of the sinks is also relatively small. In addition, you need to consider not only the dimensions of the product, but also the dimensions of the room. It may seem that all the shells are of the same type, but this is not the case. If desired, you can choose a product for the design of the room not only in color but also in shape. 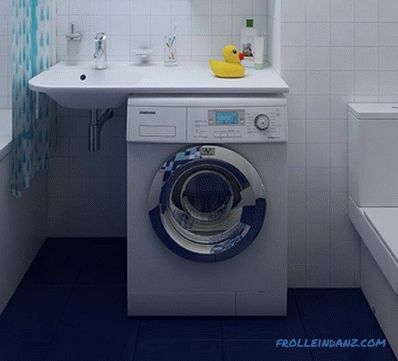 If you choose a sink for an existing washing machine, you will have to take into account its dimensions, color and shape. 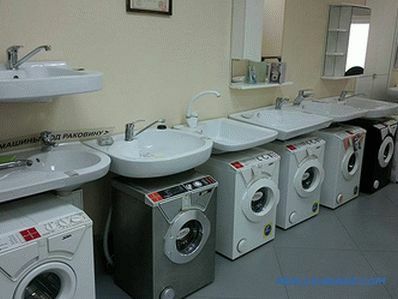 Many manufacturers of washing machines and plumbing agree and produce sets in which everything is tailored to each other, so such an acquisition would be the best option. There should not be a narrower washing machine. It may be flush, but it is better if it is even 2 cm wider - this will protect the equipment from water ingress. 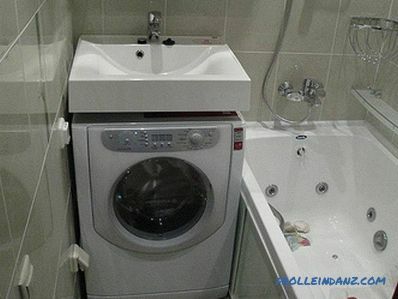 For example, if you purchased a 51 cm wide washing machine, installing a 50 * 50 cm sink will not do any good. The best option would be the size of sanitary products 60 * 60 or 60 * 50 cm. How to find out which brand is better and which manufacturer produces high-quality products? We will not impose our point of view, but only provide information, after reading which you can have a clearer idea of ​​the choice of suitable plumbing. It is important to know that manufacturers do not manufacture their products according to uniform standards, therefore, choosing a reliable manufacturer, you need to familiarize yourself with the parameters of its products in order to make sure that the sink fits in shape and size. What material is used in production. Whether the coating is of high quality. What equipment is in the factory? It is not a secret that eminent manufacturers make exorbitant wrap on the real price of the product. Sometimes this is justified, since the products are of really high quality, but in many cases less well-known companies sell cheaper products that are not much lower in quality. The products of this manufacturer are known not only in the Baltic countries, but also far beyond its borders - in Western and Eastern Europe, Scandinavia, Russia, Belarus and Ukraine. All this became possible thanks to the innovative approach of the company to the development and production of its products. In addition to standard white sanitary products, production of colored appliances and collections of cast stone was launched. The product range is constantly updated. The history of the company began in 1873. The Arabia porcelain factory was founded in Helsinki, but after 9 years it was renamed, receiving a name that has not changed until now. The plant has an environmental certificate, so we can say that the products of this manufacturer are harmless. The products are successfully sold not only in Finland, but also in Norway, Sweden, the Baltic countries and Russia. Increased demand provides a rich range of products, so plumbing can be chosen not only for the home, but also for the needs of enterprises. The plant is equipped with the most modern equipment, which employs highly qualified, specially trained specialists. 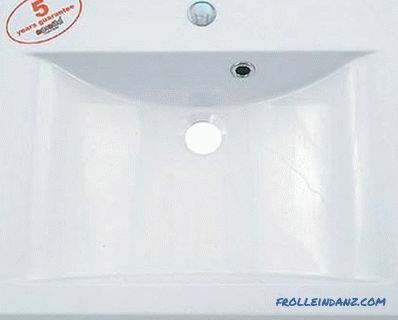 The products are of really high quality, therefore the management of the enterprise was not afraid to provide a ten-year guarantee for the sinks. RAVAK society has existed since 1991. In a relatively short time of its existence, the RAVAK brand has become widely known, successfully participating in many national and international competitions. Today, products of this manufacturer can be found in many countries, including Russia. 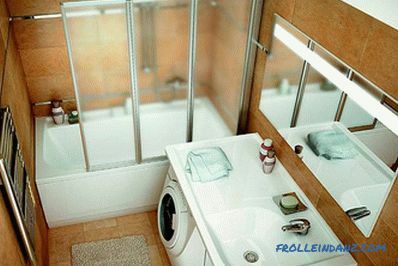 The company manufactures acrylic plumbing, polyurethane and fiberglass products. 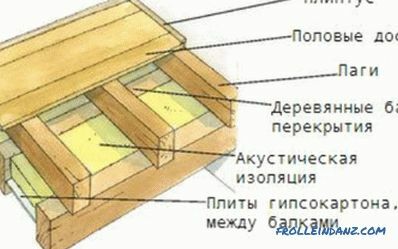 Despite the fact that the company exists for a little over 15 years, its products have become widely known and are in demand both in Ukraine and in neighboring countries. One of the driving factors was that quality products can be bought much cheaper than its counterparts from foreign brands. Such an approach became possible due to the use of English raw materials and imported equipment for work, which employs qualified specialists for a meager fee. This company has a branch in Poland and has become widely known for its products from cast marble. Molded marble creates products not only of various shapes and sizes, but also of colors. Despite the fact that many plants exist since Soviet times, they have not only changed their name. The plants have modern equipment, and products in Russia are sold at an affordable price. Sales are not limited to the domestic market. It makes no sense to list Italian companies, since each of them produces quality products that can only be purchased at a high price. Shells are not only reliable and beautiful, but sometimes look like works of art. 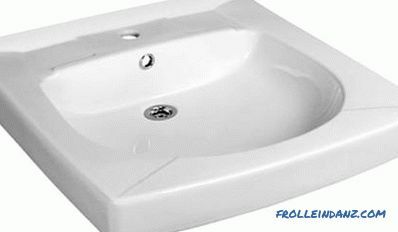 Water Sinks When choosing a sink, it is important to consider its type , and there are only two of them - Yuni and Light. Unlike light, the Yuni type comes with a hole for the mixer, but its shape is less elegant. When purchasing a water lily sink, it is imperative to pay attention to how the drain is arranged. It can be both horizontal and vertical. 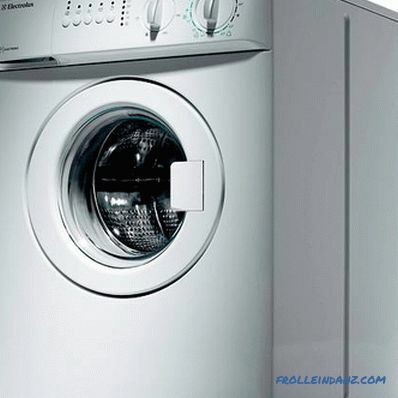 Another negative point is when the drain and siphon are above the washing machine: any leakage can cause great trouble - from the failure of the electrical circuits of the device to the shock of the one who will be nearby at that moment. This fact is a weighty argument to choose a sink with a horizontal sink that goes to the wall. 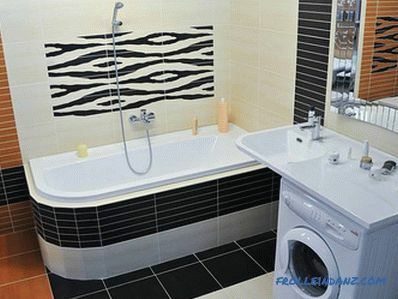 As for the shape, in a small bathroom, a rectangular or square sink would look best. If space permits and there is a need for this, then a sink with a side table top on which to place toiletries can be a good purchase. 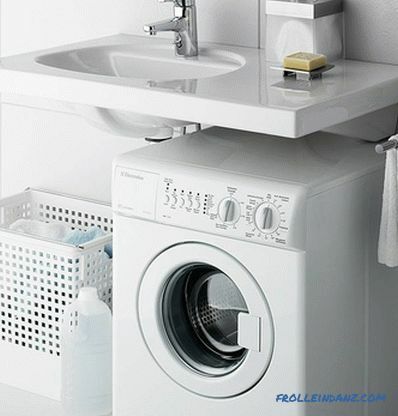 If a suitable washing machine has not yet been purchased, the task is somewhat easier because you can choose a product that comes with a sink or choose everything to your liking. Consider the list of devices that are suitable in size. Depth 46 cm, height 70 cm. Number of programs - 16. The weight of the loaded things is 3.5 kg. Spin (rev / min.) - 800. Depth 52 cm, height 57 cm. The weight of the loaded things - 3 kg. Spin (rev / min.) - 1000. Number of programs - 15. Spin (rev / min.) - 1300. Number of programs - 19. Candy AQUA 1041D1 / 2-S. The weight of the loaded things is 4 kg. Spin (r / min.) - 1000. As practice shows, people very rarely use more than three programs, so this is not the main criterion for selection. 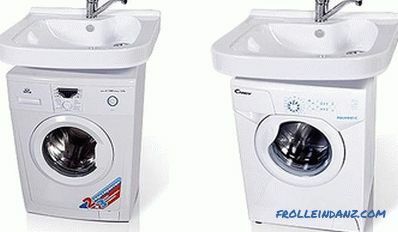 Pick a washing machine in size, given its cost (if it matters to you). One of the important moments to which it is worth paying attention to how the machine behaves in the spin mode. Ask the seller to demonstrate whether it will vibrate. When the machine is all trembling and jumping, then, most likely, it has an uncentered drum. If other models of the same manufacturer behave in the same way, then select a product of another brand. 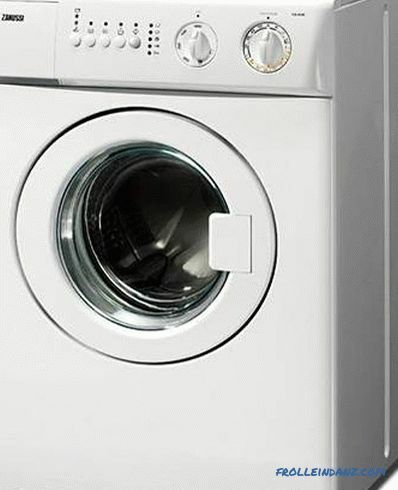 If there are no problems with the installation of a washing machine arises - it is necessary to expose it and connect, then the sink must be fixed. Consider the progress of the work in stages. 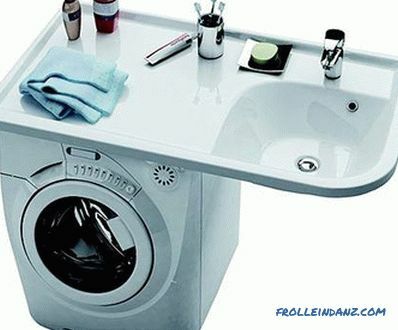 There must be enough free space to install the sink in the bathroom, so do not be too lazy to take out all the excess. Now you need to dismantle the old sink and take it out. If you purchased a domestic water lily, you can check whether it will not be possible to fix it on the fixtures remaining in the wall. 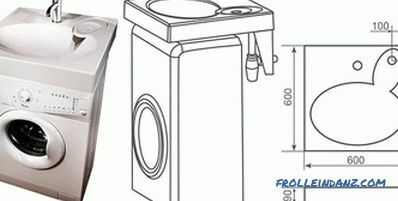 The washing machine is installed in its place, and a mark is made on its top edge on the wall. Now it can be moved aside or completely removed from the bathroom. 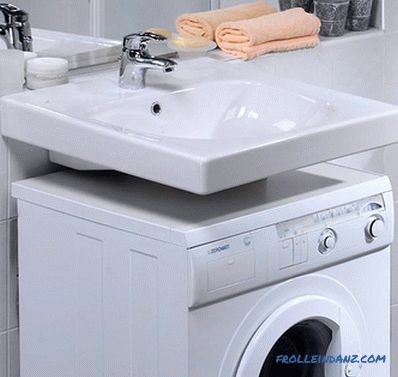 Example of a sink - the distance between its lowest point and the lid of the washing machine should be at least 3 cm. Having exposed it, make marks through the mounting holes on the wall. If the design is mounted on brackets, then the markup is made for them. 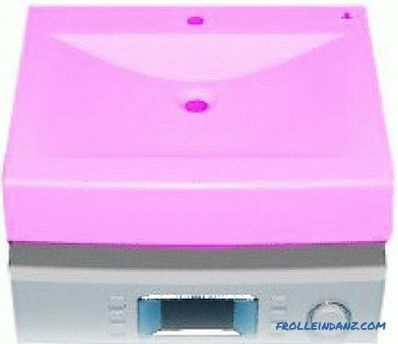 After marking, the device is moved to the side, away from the installation site. So, there is a clearly visible marking on the wall. Check its horizontal building level, and, if necessary, correct. By marking, you need to drill holes for the anchor bolts, and insert an anchor in them, after which you can install the product. 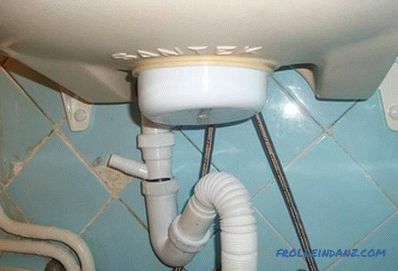 If the sink comes complete with a bracket, then it is attached to the wall, but when an additional mount is not provided, it will be necessary to fix it directly to the wall. To do this, you can use fasteners provided by the manufacturer. To prevent water from falling behind the sink, silicone or sealant is applied on its end portion. We are pressed to the wall and fixed in this position with fasteners. Regardless of what material this sanitary product is made from, so as not to damage it, fasteners should not be clamped tightly. Assembling the siphon is usually not difficult, as there are few details and the instructions are attached. It is important not to forget to put in place the rubber pads. The collected siphon is attached to the sink. 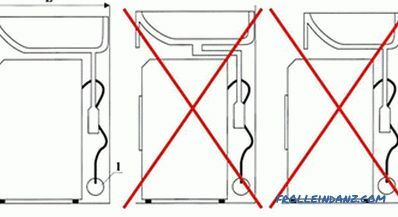 It is not necessary to make great efforts, since it is possible to spoil the plastic parts. With the help of a corrugated hose, the siphon is connected to the sewer pipe. If the faucet is installed on the sink, then its connection is made by plumbing flexible hoses. Having let the water in, you need to check that there are no leaks anywhere. 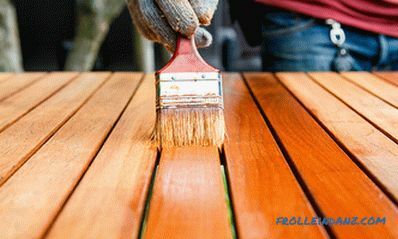 If there is a suspicion that some kind of compound is poorly connected, try to slightly compress or reassemble it by brushing the rubber gaskets with sanitary sealant. 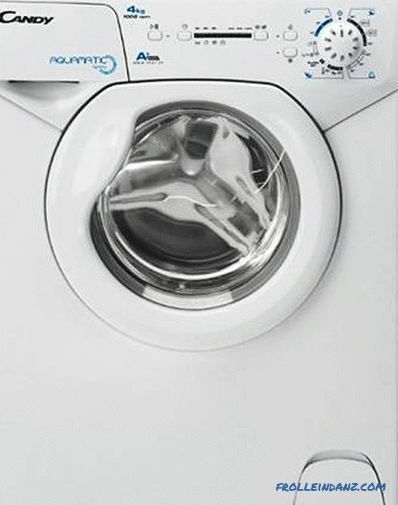 It was the turn of the washing machine - you need to install it in its place, connect it to the sewage system and connect it to the water supply. Now the machine is level by level, and it can be used. 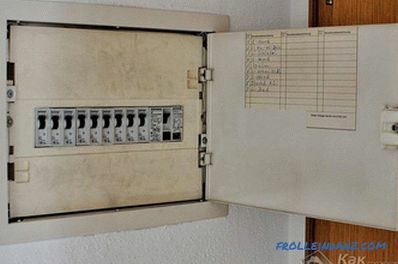 When connected to an electrical outlet, start the machine in spin mode and check that it does not touch anywhere else on the sink itself or on any pipeline. It remains to restore order and enjoy the work done. 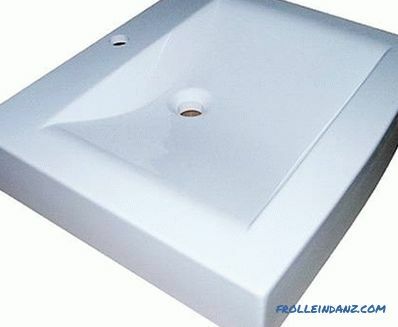 The most common and customary for most people are ceramic sinks, for the manufacture of which earthenware is used. The material itself is inexpensive, but to give it an aesthetic look, a layer of special glaze is applied to the product. Such products are the cheapest. In porcelain products, the surface is harder, smoother and non-porous, unlike products from earthenware, which affects the cost - they are more expensive. 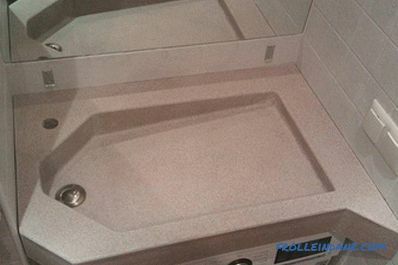 Sinks made of artificial marble are made of special polymer concrete, to which dye can be added, due to which products of different colors and shades can be obtained. Outwardly, this product is very similar to natural marble. Special care is not required. As for the cost, it is somewhat higher than that of the devices described above, but it corresponds to the quality of the product being purchased. Marble products are the most fashionable and very expensive. Natural marble of various colors is used for their production. Such shells are very beautiful, but unlike artificial marble, they need careful and painstaking care. The fact is that in natural material there are a lot of micropores, into which dirt and grease get clogged, and it is rather difficult to remove. Many brands make their mark, so the cost depends not only on what material was used to make it, but also on how well-known the manufacturer. 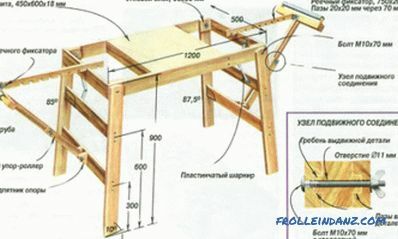 In the table you can see a description of some types of sinks, with an indication of the approximate cost. Dimensions W * D * H: 600 * 600 * 96 mm. There is a hole for overflow. The location of the drain hole is in the center. Dimensions: W * D * H: 600 * 590 * 175 mm. 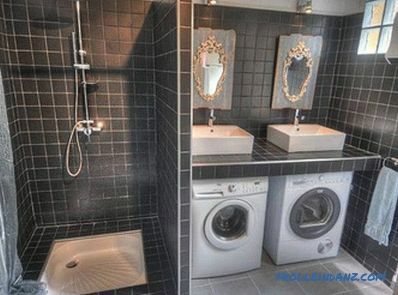 The location of the washing machine is at the bottom. Dimensions: W * D * H: 1160 * 650 * 165 mm. 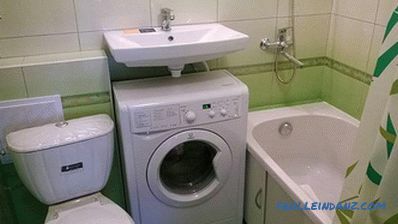 The location of the washing machine is left or right. Dimensions: W * D * H: 600 * 500 * 130 mm. A hole for overflow is - (can be purchased without overflow). Product color: white, pink, red, green. Dimensions: W * D * H: 600 * 500 * 110 mm. Dimensions W * D * H: 600 * 550 * 110 mm. Dimensions: W * D * H: 605 * 515 * 175 mm. Hole for overflow - no. 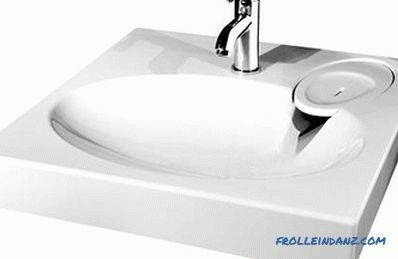 Having learned the features of pricing, you can make a more rational approach to the choice of this sanitary ware product.